I have already confessed that once I was a fan of Amrinder for he talked of better relations with Pakistan and support to Kartarpur Corridor movement. 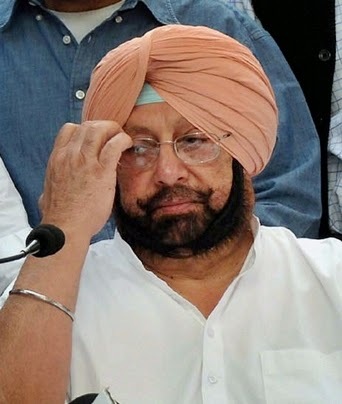 But he disappointed me in 2004 when he was to raise the demand before PM Manmohan Singh on Sept.1, 2004 and instead it was raised by Parkash Singh Badal. Further his wife Parneet Kaur has been the Foreign Minister for a long time now and she never helped the Sikhs on issue of pilgrimage to Pakistani Sikh shrine and never supported the Kartarpur Corridor movement. Amrinder was unwilling from the day one and yet he was forced to fight from Amritsar seat. He waited for week to and ultimately came to Amritsar. True to his Congress colours the first thing he did was issue a highly communal statement. He asked Jaitley how could he take support of Akali Dal which killed 35000 Hindus and that the Akalis have made a memorial for those killed in 1984 Operation Blue Star. As a matter of principle he should have sought votes on the basis of performance of his Govt in Centre. But the fact is he hardly has any thing to claim. On the contrary there is a long list of injustices meted out to Amritsar by the Congress. The recent being diverting of international flights from Amritsar airport to Delhi. I am quite aware that BJP too is not a real friend of Punjabis but they are a lesser evil. Also BJP is the Akali partner who have Kartarpur Corridor on their agenda. Also the Akalis have supported my demand of 'VADH BACHEY BACHE PUNJAB'. Also we in Amritsar feel that even the Congressites are themselves working for the defeat of Amrinder besides our friend Dr. Daljit Singh AAP is claiming share from Amrinder's tradition Congress vote bank. So who will take a ride on a sinking ship?